We’ve been asked more than a few times whether or not we could send pulses over a building’s existing local area network or Ethernet. We figured we better get busy and see if it was possible. We’re happy to announce that it is in fact possible and we now sell the EPL-1 Ethernet Pulse Link system which transfers pulses over Ethernet between a transmitter relay and a receiver relay. This system is similar to our OPL-Series fiber optic pulse link unit, but uses the local area network to transmit pulse information. Since Ethernet is almost universally used in commercial buildings, installation becomes quick and easy without the tedious process of running wire. The power supply, wetting voltage, isolation relay, and terminal block connectors are all included making it possible to have the Ethernet link up and running in no time! 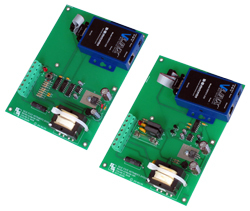 The EPL-1 system is comprised of one EPT-1 Ethernet Pulse Transmitter and one EPR-1 Ethernet Pulse Receiver. Static IP addresses are required for transmission between the Ethernet converters contained in each transmitter and receiver. The transmitter will accept either a Form A (2-wire) input or a Form C (3-Wire) input. The receiver offers one Form C solid state, dry contact output which can be used as either Form A or Form C.
So if pulse transmission over a local area network is in your future, contact the KYZ pulse experts at Solid State Instruments; we have the simple, cost-effective solution you’re looking for! Notice: The EPL-1 is not a regularly stocked items and is avalable by Special Order only. Please call the factory for a quote. Next Article: Line vs. Low Voltage: What's the Difference?